Rowlesburg is a railroad town that has turned to tourism in a big way. Each year the town celebrates six major festivals from May to December, and now hosts two big WV Bicycle Racing Association events. The town is blessed with great beauty, a rich history and a town that itself looks like the little village under the Christmas Tree. One observer noted on a recent visit, "Rowlesburg is still a magical place." The world famous Tray Run Bridge, which signifies the importance of the railroad to the state's economy, is featured on the reverse side of the West Virginia State Seal. Rowlesburg is known for its festivals, Civil War and railroad history, and outdoor recreation. Take a trip to places such as the World War II Museum that features mannequins in authentic military uniforms and other war memorabilia, the B&O Museum Bridge Exhibit, the Depot Museum or tour Cannon Hill, a Civil War battle site. Those wanting to enjoy nature will be able to hike on the Allegheny Trail, bike, paddle the Cheat River Water Trail, ride on two National Byways, fish and raft the whitewater, just to name a few. “The Festival City,” Rowlesburg offers visitors a chance to take in a part of history at the Annual Civil War Weekend-Victory of Rowlesburg the first weekend of May. For those wanting to learn more about World War II, an Annual WWII Reenactment is scheduled during the last weekend in June where several dozen demonstrations are in store. On Memorial Day weekend, the River City Arts Festival offers a variety of live musical entertainment ranging from opera to folk. The annual Labor Day Weekend Festival includes carnival rides, music, parade, fireworks, tours to Cannon Hill, war exhibits, train show and a famous Ox Roast. The Annual West Virginia Chestnut Festival is held on Columbus Weekend in October. The festival features a rich array of food, music, seminars, vendors, roasted Chestnuts, and a banquet with the crowning of King and Queen Chestnut. Christmas Market second Saturday in December. European style Christmas Mart featuring bratwurst, Gluewein, crafts, foods, music, and decorations. Szyilagi Center. Exhibits open. 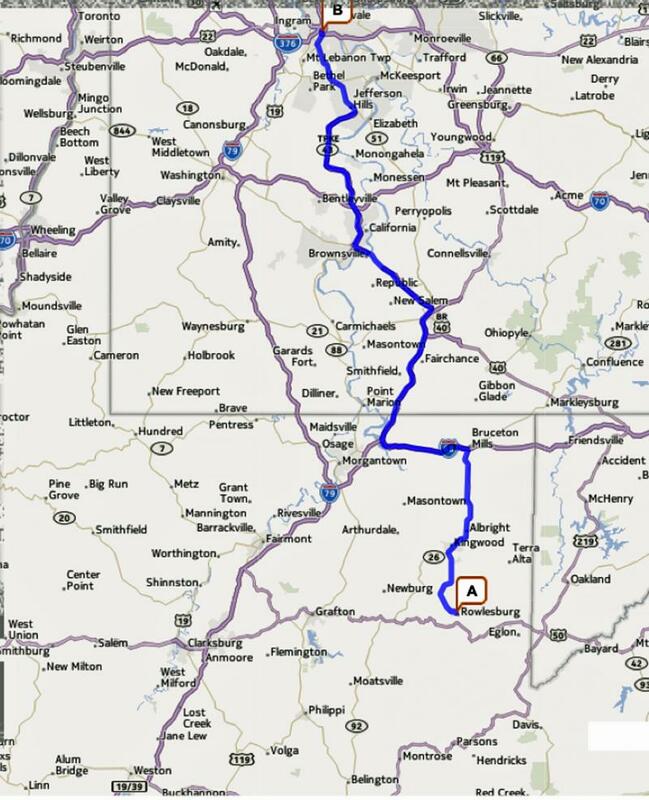 Rowlesburg is located 113 miles﻿ south of Pittsburgh, PA. Driving time is approximately 2 hours, 14 minutes.